Smoked Salmon There are 43 products. 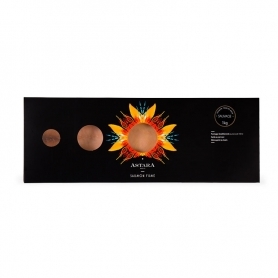 Worked in Switzerland, entirely by hand, with an exclusive recipe and distributed worldwide by a small number of retailers. 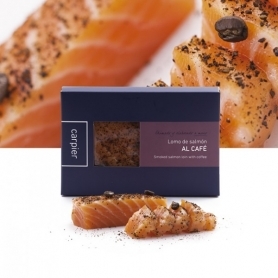 From Barcelona Carpier experiments with the new frontiers of smoking and processing of salmon, in an extremely traditional and static commercial landscape. All at the highest quality levels. This commitment has led to many international awards and to the presence of Carpier in Spanish high catering, from Adrià to Berasategui. 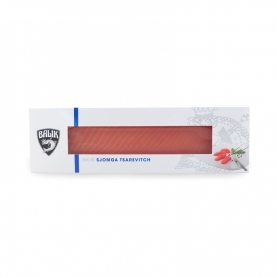 First Carpier created the "dried / seasoned" salmon in the form of a baffa and sausage. A new frontier of the senses that no true gourmet can miss. A salmon Baffa. 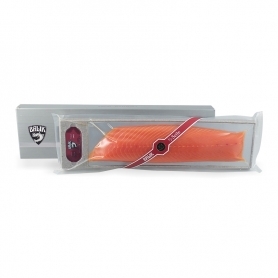 Probably the best salmon you will ever taste, in a whole Baffa from about 1100 gr. 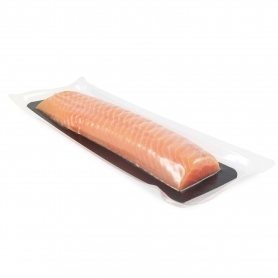 The wide range ofsalmonBalikThey have always inspired totraditionScandinavian; perfectingthe traditional recipe with refined smoking marinades. And 'so that it becomes Balik brandmodernityand innovation. A new sensation will envelop your taste buds. After smoking, this product is macerated in Spain's most famous gin tonic "Citadelle Gin", with an exceptional result. A aftertaste sublime approaches to the dry effect of gin tonic without being brash. 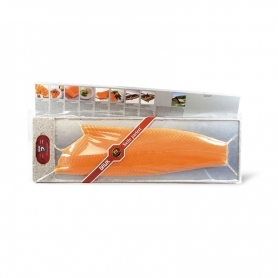 The classic Carpier salmon contains the choice of the best parts of Norwegian salmon. Once the smoking process natural the salmon is sprinkled with powder and coffee beans and later sprayed with olive oil brew with coffee.